My container garden doesn't know if it's coming or going! 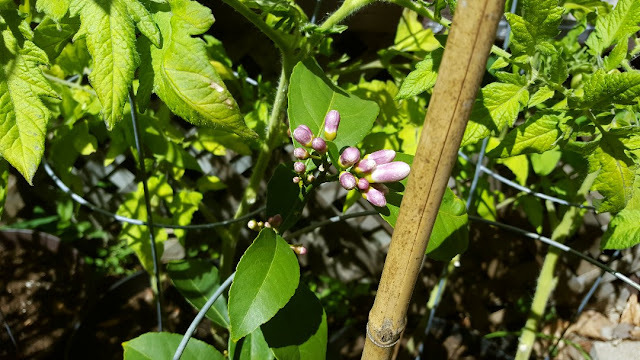 Look at all of these little lemon buds forming!! My lemon tree is really thriving but alas...I don't think I'll get all of these lemons growing to their fullest. This tree needs lots of sun and warmth; my hopes are up, but I think they'll all drop before the end of August unless we have an unseasonably hot autumn (fingers crossed!!). My third round of lettuce is bursting out of the container too. I have to start another container to make sure we have a steady supply in August. We have to get to eating it! Last night for dinner I made a Caprese Salad. It's basically a tomato and Mozzarella salad with basil, but we added lettuce. I can't wait until we can use our own tomatoes for this salad! Everything else is home grown or homemade! I also made a few Bianca pizzas with our leftover pita bread. This is just olive oil, garlic, basil and fresh Parmesan. The pumpkin patch is bursting through the fence...but I do see yellow and orange flowers growing! I still have the chicken wire sitting on top of those leaves...I'm paranoid about the birds. People put up scarecrows for a reason! The leaves are strong enough to hold the chicken wire up without it pushing the plants down anyway, so I'll leave it as is for now. The tomatoes are slowly starting to grow bigger...I counted maybe 3 dozen between the regular tomatoes, Romas and cherry tomatoes. Alex pitted another couple of hundred cherries and we used the last of them. He made more concoctions with brandy, Amaretto and Absinthe and I asked for a cup to do something on my own. 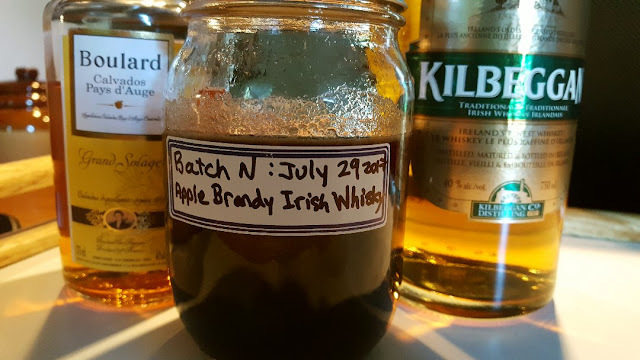 I remembered once having a cocktail that had Irish Whisky and apple so I decided to try that combination with the cherries. We'll see in a few months if my palate is spot on or way off! Now I'm going to sit and enjoy the sweltering heat while I have it! 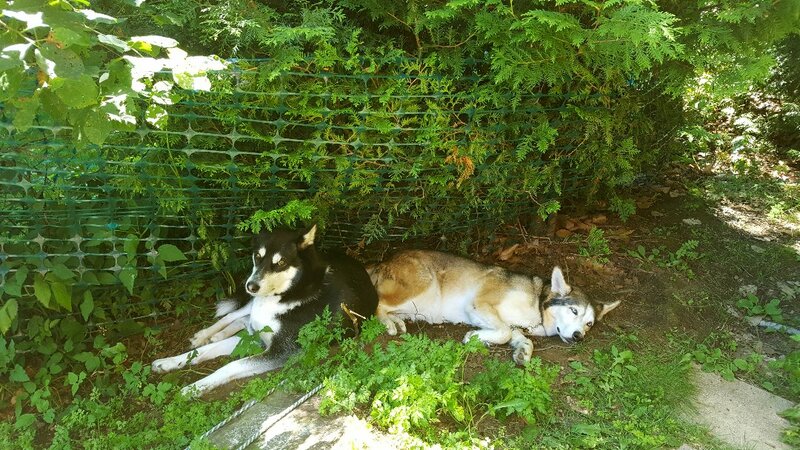 The huskies are happy in the shade under the trees, getting all nice and dirty. I hope this little heat wave continues! Look at you go with EVERYTHING! LOL! You are one amazing woman. The knitting is spot on and your stitches are so even. You really do amaze me and motivate me. The food is making me hungry....I should know better than to read your posts when I am hungry! Ha! Ha! 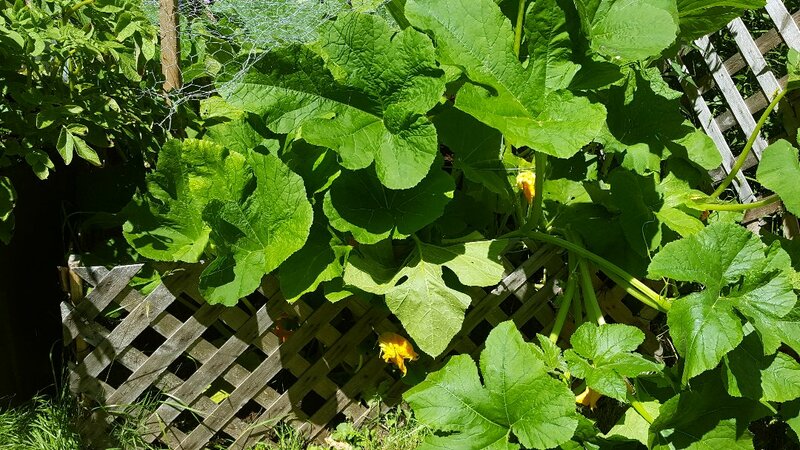 Your garden is going gangbusters and the cheese....what can I say. I think you have a green thumb for the plants and a yellow and white thumb for the cheeses. I am so happy for you as you worked very hard to make it all happen and you did!!! 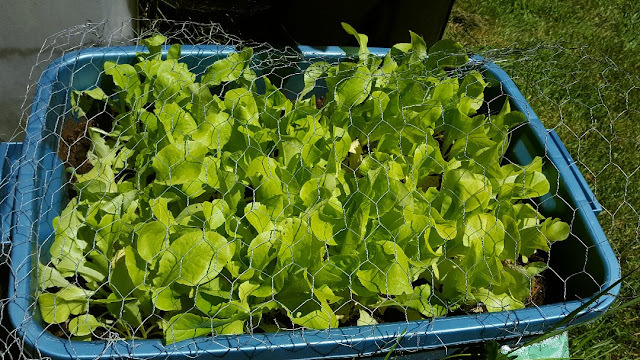 I am taking notes and since we have like 3 seasons here it's not too late for me to replant some stuff but this time I am cutting the chicken wire and wrapping it over the planters like you did. I had no idea the deer would come right up to the walls of my house....those stinkers...they have no shame! Keep up the great work and enjoy your summer heat! What great huskies you have. I see many dog owners on IG having those small kiddie pools for their dogs. Your cheddar looks awesome. How neat you just keep it out like that and the mozz? Oh man, I'm comin' over for dinna! You made me LOL about wearin' all 'da black b/c I have so much of it in my wardrobe too! It's all city clothes. When I go to the hairdresser I'm all about arming myself with screenshots of what I want on the sides, back, and how to look in the front. Pinterest is my source. Hi Sam :)) Thank you! :) When I started knitting many moons ago, I taught myself, and this was WAY before You Tube...think Commodore 64 days lol...my stiches were SO TIGHT. I had trouble knitting and couldn't figure it out, I'm glad I relaxed over the years and gave it another try! I am really hoping to reach the arms by the end of the week. The group is so motivating. I laughed so loud at yellow and white thumb for the cheese, my neighbours must think I'm loony hee hee. I hope your next season works out well with the chicken wire, though I have found it a big painful bother to work with, gloves and all. It does work though but I wish I had another way. 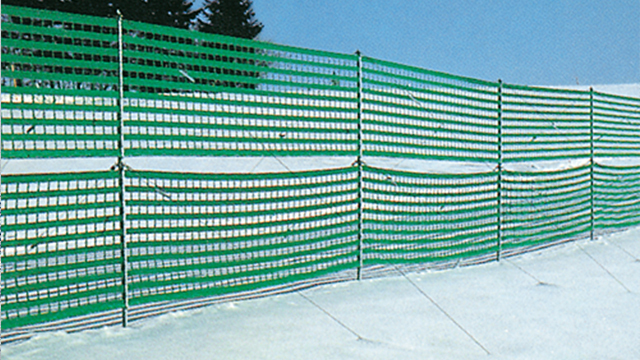 Maybe Snow Fence...we have that around the property but it's so much more expensive, not as "ouchy" though!! Soon I'll be planning my WINTER garden!!! I've been reading so many books and I'm really hoping I'll have some success. I have to get more organized, I already have some seeds that are winter hardy, but I need to get going on the raised beds and cold frames!! Snow won't stop me ha ha! Hi Ruth :)) I do love sitting on the porch knitting, it's really nice. And I don't want to fall into the trap of "having" to get it done or I'll make mistakes. I want to enjoy it, so I think you're right. It gets done when it gets done! I'll have something nice to wear over my bathing suit next April when the sun is hot but the snow is still on the ground lol...I'm so excited about the Cheddar!!! We'll see...I should do a live unveiling lol...Oh lucky you! Kilbeggan is my absolute favourite Irish, it's so much smoother than any other I've tried and we have a great selection here! I've got this picture of you in my mind and you'wrapping a scarf round the cheese to stop it from getting a cold and you're reading bedtime stories to it. Please tell me I'm only imagining it and that it isn't true. Oh, you silly girl! This heat and humidity is not setting well in this here house! Neither of us do well in the hot weather. 'Bout did ourselves in yesterday trying to get the lawn mowed (didn't finish) and do what needed to be done in the garden. By the time dinner was finished, we were both staggering around asking to be pointed toward the shower. I'm still in awe of how you've jumped into this cheese making thing. Oh, to have the time and energy and enthusiasm for it as you do. 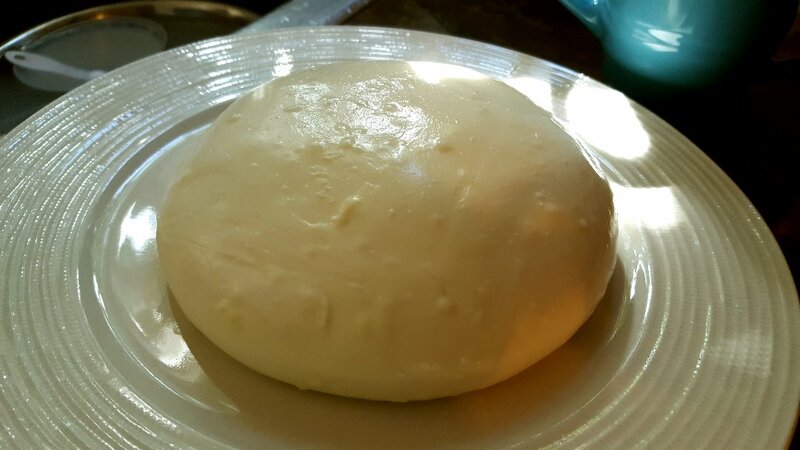 We're enjoying my homemade cottage cheese this summer, but that's as far as my talents go. Yes, you do have very even, lovely knitting stitches. It's fun for me to see the beach cover-up progress. Keep up your wonderful enthusiasm in all you're doing. So many tomatoes in your garden already?! Wow. Just wow. Hi Mama Pea :))) Lol...I LOVE the heat and humidity! I think it's because our winters are so dang long in this area. I'm the type who can sit out and melt then run into a cold shower and feel revived! :) But honestly on really hot days like today, it went up to 38 C (I think that's near 100F), we don't do much. Dinner is club sandwiches with pre-cooked chicken, I don't even want the oven on!! I have never made cottage cheese so there, you're a step ahead of me!! :) I love the stuff though, I need to look into making that too. I'm really loving the cheese making...bacterias and moulds...love it! :) And thanks re: the knitting, I have to really concentrate. Actually I haven't decided about the Hudson's Bay blanket if it'll be stockinette or garter yet, are you going to make one? Really lovely indeed, hope you enjoy the warm weather while it lasts. Wonderful garden and thoughts and photos. Greetings! BAHAHAHA! I was getting ready to write something fun and then I read Terry's comment and couldn't stop laughing. A snorting kind of laugh 😄 MYGOSH...his comment was so funny. I love your simple and wonderfully joyful life! Cheese sitting - lol. Now that's the life! :) The cheddar cheese wheel looks amazing. All of your food and garden pictures are just wonderful, Rain. Very inspiring. Hi Nik :) Thank you! 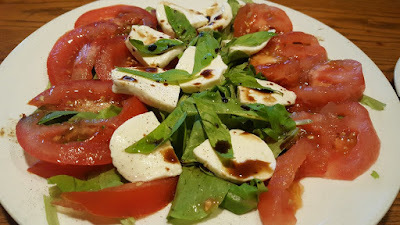 The Cheddar...I'm so proud of her...or him...I shouldn't make it so personal lol...this was our first Caprese salad and it was SO GOOD and fresh! I could see it being yummy with goat cheese too. Oh, I hope you have your supplies soon! 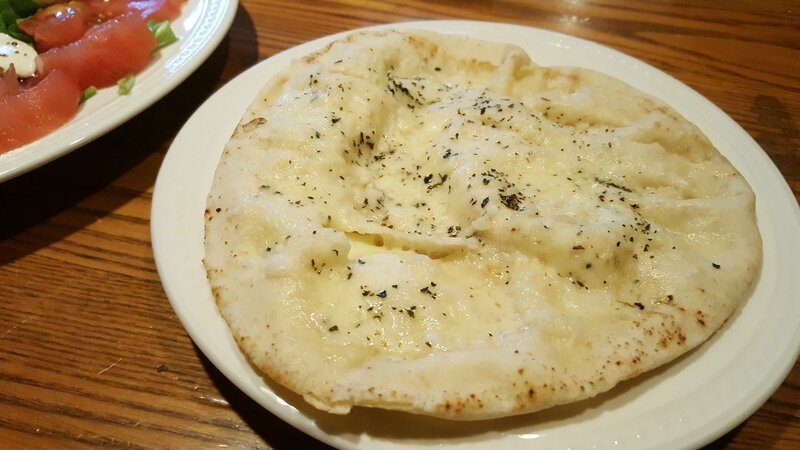 The Mozzarella is so nice when it's fresh! Hi Jenn :) Thanks! I'm so happy about the Cheddar!! :)) We used our fresh basil too, it was so delicious, it'll be a keeper salad that's for sure. I hope you get more sunshine! Hi Becki :) Ha ha...this IS the life. I'd much rather cheese-sit then commute and work a 9-5, even if it means living more frugally and simply! :) Thank you! 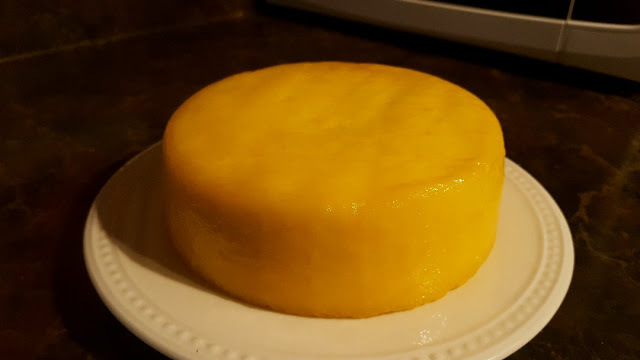 I think the Cheddar turned out really well - so far! We'll see on Halloween! I think you are the only person I know who actually LIKES heat and humidity! I wilt. Your cheese looks fabulous! It is so exciting! That beach/summer cover-up will be perfect for early fall days, so you go, girl! Hi Susan :)) I think so too, even Alex is indoors during this weather! I just get so "SAD" during our long winters that I want to be outside as much as possible when it's summery! The cheese is a big source of pride! :) The cover up is going well, but I'm finding it hot on my lap as I knit...I think it'll suit the fall much more! That cheese!!!!! Wow. I for one cannot wait for Halloween (but not for cheese reasons) and I can't wait to see how it all goes! What a process though! Lots of progress on things! I think knitting is something I'd like to try one of these days. I may be too impatient to make cheese but I love seeing how you're doing! Now I have to count down until Halloween to hear how your cheddar turns out. It is quite the commitment you have there - babysitting that cheese. You puppies look cool indeed and I can't wait to see your cover-up - it looks gorgeous. Hi Mary-Anne :)) I'm definitely counting down!! We are having internet problems so it's giving me a chance to knit more. I might get the cover up done in August after all! Tomato salad with fresh basil and cheese is something I love. Hi John :) Me too, especially when it's all home grown and home made! Your cover up is lovely and I can see it being finished very soon. Your salad is thriving, ours had a great start but has been attacked by something - probably caterpillars. We have also started to get our tomatoes, waiting atm for our cucumbers. And the cheeses are just splendid, can't wait to see how the cheddar tastes. Thanks Lucy :) Hmmm...some of my lettuce has some holes in it, I never thought of caterpillars, but I'm going to keep my eyes peeled. And thanks for your comment! :) I hope I get my cover up done before the summer ends!! !